Invasive species are species that are not native, or indigenous. They are usually species that have been introduced by humans and which cause problems in the new environment to which they have been introduced. Invasive species often have few predators or competitors in their new environment, allowing their populations to increase unchecked. As a result they can upset the balance in natural ecosystems, but they can also become pest species causing damage to agricultural crops. The non-native American mink has been present in Lewis and Harris since the 1960’s when animals escaped or were released from local fur farms. These small predators are a great threat to ground nesting birds through predation of eggs, young or adult birds. On the Western Isles where most bird species nest on the ground, Mink can have a particularly devastating effect on local populations – tern and wader species are particularly susceptible. In North Harris mink predation also has a significant impact on wild salmon and upon crofters’ ability to keep hens successfully. The Hebridean Mink Project is an ambitious project working to eradicate mink from the entire archipelago of the Western Isles. 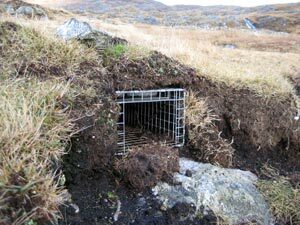 Over 7000 traps (on average 3 traps per square km) have been dug in across Lewis and Harris with trap lines being set for one to two weeks at a time on a rotational basis. Traps are bated with scent specific to mink to ensure that no other animals are caught. Over the last 3 years over 1500 mink have been caught and the project is now in its final phase of monitoring and targeting trapping to areas where there are known to be small numbers of mink that are still surviving. In order to assist the project staff the Trust has started setting and monitoring a small number of traps in areas known to be attractive to mink in order to assess whether mink are still present, and where further trapping should be prioritised in the future. If you come across a mink trap, either set or un-set please leave it untouched where it is. When set all traps are checked daily and any animals caught are dispatched humanely. If you would like further information please contact the Hebridean Mink Project (see link above). Invasive plant species are a growing problem in many areas, and unfortunately North Harris is no exception. In autumn 2009 we conducted a survey of two invasive species: Gunnera and Piri-piri Burr, that have started encroaching on areas of North Harris and are of some cause for concern. Gunnera, commonly known as ‘Giant Rhubarb’ is native to South America and was introduced to Harris as an ornamental garden plant around 20 years ago. However, it has become an invasive species, spreading out of gardens, onto neighbouring crofts and hill ground in some areas. Growing to a height of 2m and with its large leaves, Gunnera can shade out and out-compete native plants and can also cause problems by blocking drainage ditches and access tacks. The plant thrives in our mild wet climate and can spread rapidly. Some research into the species has revealed that Gunnera has been causing problems in Western Ireland, where the climate and habitat is similar to ours. 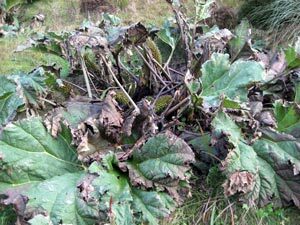 Although Gunnera is currently restricted to a few areas of Harris, we want to stop the problem from getting out of control before it’s too late. After mapping its distribution on North Harris have we have been carrying out trial controls to see which methods work best and whether it is a realistic aim to eradicate the species from the estate. Our control methods have inculded removing seed heads, digging up entire plants and spraying plants using Gyphosate based pesticides. 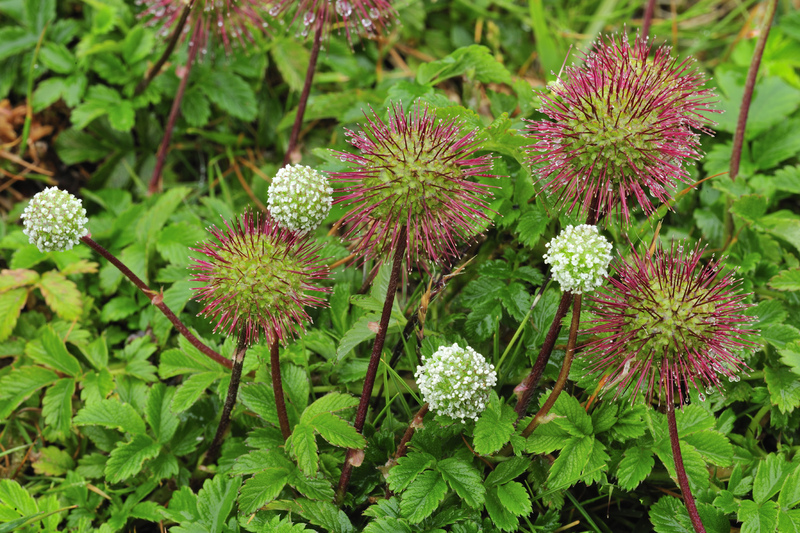 Piri-piri Burr (Acaena novazelandiae) is currently found along paths and stream sides in an area to the North of Abhainn Suidhe castle. This is a low growing invasive species native to New Zealand that is thought to have originated through seeds brought over in wool imports. The burr which contains seeds is spread by walkers, dogs and livestock. The species does not like wet and frosty conditions so is unlikely to spread into high altitude areas or wet habitats but may be out-competing native species in some areas. We have surveyed the extent of its distribution and are exploring ways of controlling its spread.